In Windows Vista with Windows Aero Transparency Glass effect enabled, the built-in Windows Media Player 11 (WMP11) has an interesting visual effect. The trick will make the whole window of WMP becomes transparent in a incredible coloring, including the some text and buttons. To place WMP11 into such transparency effect, ensure that WMP is in “Now Playing” mode without any media playing, and is not maximized. Then, use mouse point to click and hold on the blank space of the control bar (faint white area) at the bottom of the Windows Media Player window. Then, move the whole WMP 11 window upward to the top of the screen. If you can’t move the window, make sure that the WMP window is not maximized, and you click and hold onto the correct area. Once the window is on top (most part of window won’t visible as out of screen view), release the mouse button. 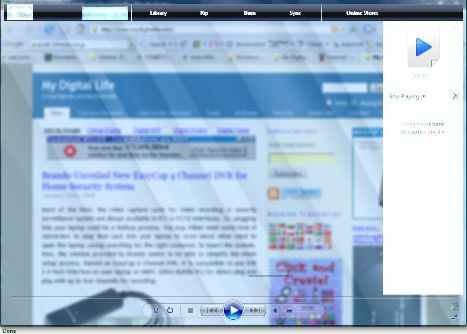 And watch the magic of Windows Aero effect on Windows Media Player 11 window. Well, you can call it a bug if you wish too. 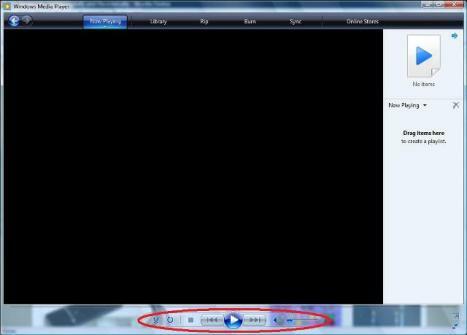 For best result of Windows Aero glass transparency effect on WMP, set the player visual effect to “No Visualization”.